Fundraiser Campaign: Int’l Svc: World Community Svc Comm. 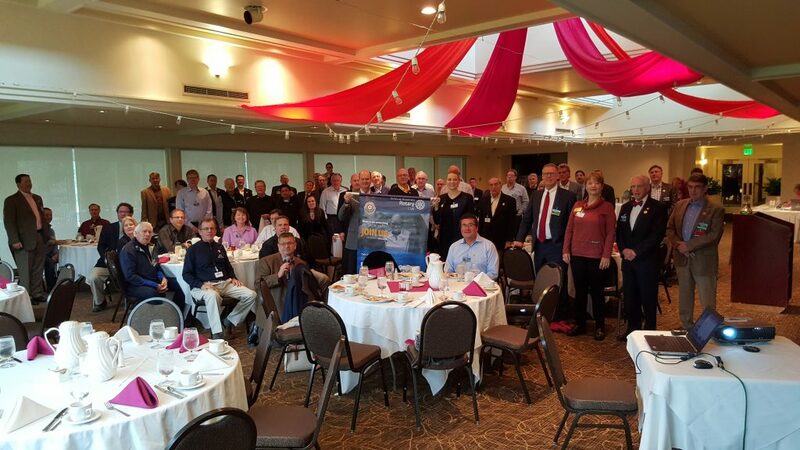 Let it be said in years to come, that the Rotary global campaign to eradicate malaria started right here at the Bellevue Breakfast Club. They said it couldn’t be done. They said that a diverse club of nearly 100 people could not all get behind a single cause in less than a month. It took only 18 days, 3 hours and 42 minutes for all 96 members and ambassadors to pledge. 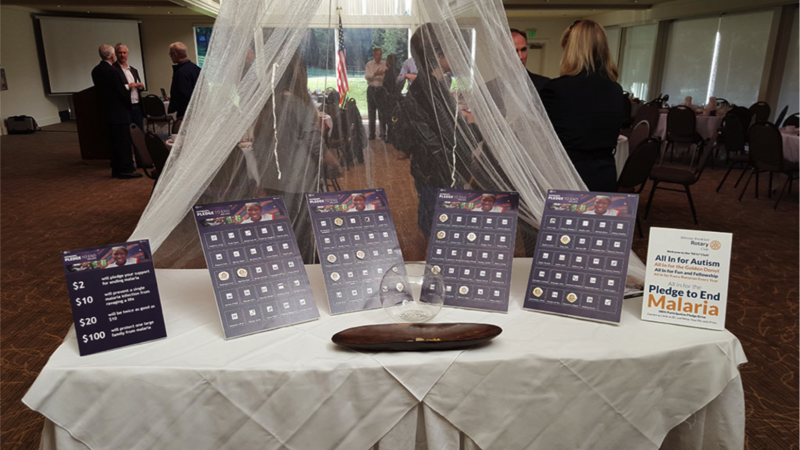 We thought that Jim Owens, being confined to a nursing home, would not be able to participate in person, so at the second meeting, we auctioned off his pin for $200 (thank you Steve Lingenbrink!). Imagine our surprise then when the following week his wife Karen insisted that Jim would like to make his own pledge! Steve graciously ‘sold’ Jim’s pin back to him for $10. David Stokes, our guest speaker at the week of the launch threw in $100. Cyril Faulkener was the last member to make his pledge, putting in $27 to bring the club total to $3,500. Joe Castleberry, a past member, donated $76 from the proceeds of sales of his book when he came to give a presentation several weeks after the campaign had officially ended. The President of the RMP Larry Granat, and Board member Corrine Cavanaugh, presenting the banner to the club to mark the first club in the world to join the advocacy campaign with 100% participation. Along with the impressive turnout, money also followed. The club presented a check to Larry for $7,000 – which was $3,500 raised from the campaign itself, which was matched by $3,500 from the club. We created ‘pin boards’ with a pin mounted against each member’s name. The minimum donation $2, but the average ‘suggested’ donation was $20. In the end, BBRC members average just under $35 – an amount which has proved rather consistent with other clubs. When a member pledge, they took their pin from the board, and wrote the amount of their donation on the board. This proved ‘a remarkably effective’ way of generating excitement and participation! What does the RMP Do?